One of the sources I’ve seen mentioned several times in my research on Brookshires is a book by Glenna Brookshire Beck and Charles Randolph Sheridan called The Brookshire Family. This has long been on my mental wish list of books to look at. Several months ago, I wrote down my wish list of family history books to look at and looked the titles up in WorldCat and various nearby library catalogs to see which books I could easily access and which would need to be ordered or looked at on a research trip. 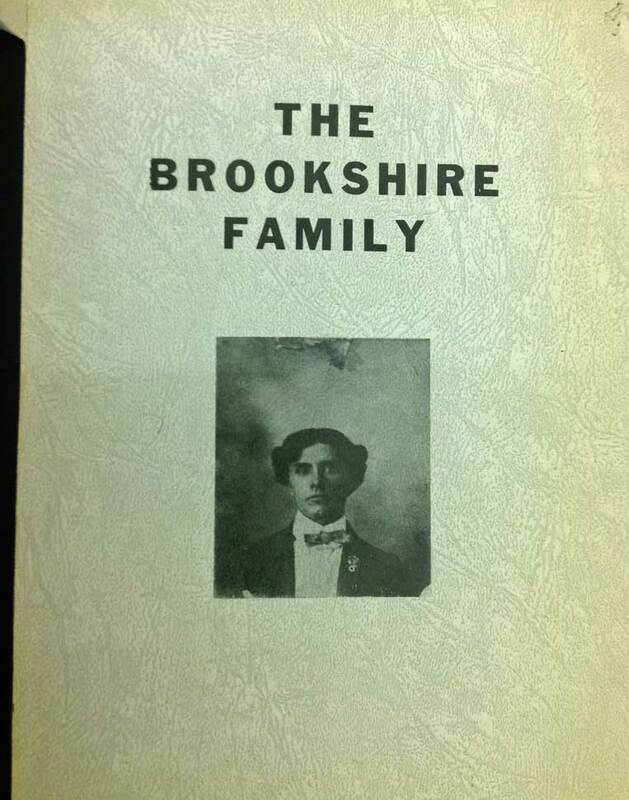 It turned out that the Chattanooga library has a copy of The Brookshire Family. Yesterday, I was in Chattanooga and made a spur-of-the-moment decision to go to the library, so I consulted my list of books (which I keep in Evernote for just such occasions) to see what they had that I wanted to look at. A ha! The Brookshire Family. A quick search in the online library catalog gave me the call number and I was ready to head straight into the stacks when I got to the library. I’m quite impressed with this family history book. It’s not cited to today’s standards, but the sources are worked into the narrative, as well as the authors’ thought processes. They tell why they think a certain record applies to this Brookshire family, explain how and why they connected children with parents, talk about negative searches, etc. It’s very well done. I had less than an hour to spend, so I didn’t take the time to read, just scanned over & snapped photos of the pages that looked promising. I got 45 pages photographed, which will keep me occupied for a long time. The book begins with the Brookshires who crossed the pond, giving the name of the passenger ship that they traveled on in 1674. They came from England as indentured servants and settled in Somerset County, Maryland. I would love to find the terms of their indenture. The book also has transcriptions of some estate records from when the family was in Maryland. I believe that Maryland estate records have come online at FamilySearch, so I may be able to find some of the originals fairly easily, depending on the dates. While I already had the names of this immigrant couple – James and Mary – and of their children, all my information came from things like message board posts and unsourced county histories. The source references in The Brookshire Family make it a more reliable source and I can use it as guide to find the original records. I am trying to find information on the Brookshire Family tree.. I only have 4 generations of names. Hi Tonya, what can I help you with? I too am a Brookshire researcher and have been unable to find the parents of Jane Brookshire as she is shown on the census born 1825 in SC married Samuel Leamon sometime before 1850 and must have died before 1880 as the family is living in Murray Co Georgia. On one sons obit she is shown as Anna Jane, also have a document that was sent to me regarding the marriage of another her son in which her parents are show as James Brookshire and G Ray. But nothing else ties her to them, and I have been told that she is not mentioned in “The Brookshire Family” book written by Glenna Beck. The problem with books like this, is that way up here in WI I can’t get my hands on them. I’ve got my list, too and I’m reduced to writing to people to see if I can buy a copy. My Brookshires descended through William I, William II, Henry, and then Cynthia – after that – no more Brookshires. Is there any pictures in your snapshots, or pages that you took that you could/would share with me?